When wandering the beaches this summer, have more to say about the shells you find than why you can hear the ocean in them. 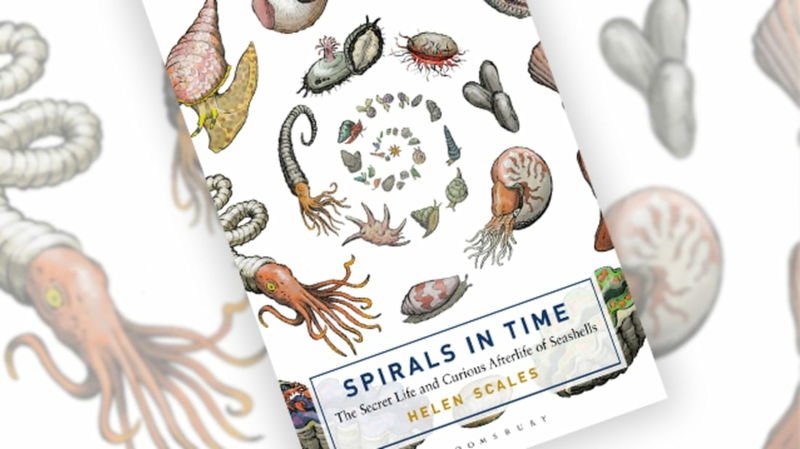 Marine biologist Helen Scales’s Spirals in Time: The Secret Life and Curious Afterlife of Seashells is packed full of interesting facts about seashells and the creatures that create them. Here are just a few you can use to wow fellow sunbathers this summer. 1. MOLLUSKS MAKE ONLY ONE SHELL. 2. MOST SHELLS OPEN TO THE RIGHT. Sleeker mollusks, meanwhile, can use their streamlined shape to move without detection and to get away quickly. A shell’s shape can also keep the mollusk from sinking in sand and mud, or to keep them anchored in it. 4. THE PATTERNS ON SHELLS AREN’T RANDOM. Recent research suggests that the elaborate colors and patterns on shells are, Scales writes, “not frivolous playthings but important registration markers for shell-making that have been subject to the forces of natural selection, and have evolved over time.” In other words, mollusks might use the patterns to figure out where to put their mantles to continue making their shells. Scientists still aren’t sure what kinds of pigments the mollusks are using. 5. THE OLDEST KNOWN HERMIT CRAB USED AN AMMONITE SHELL. There are nearly 1000 species of hermit crab existing today, which rely on old seashells from dead mollusks to protect their soft abdomens. (Interestingly, according to Scales, hermit crabs never kill the current occupants of the shells; they wait until the mollusk has died, and let other animals do the eating, before they take over.) The oldest known hermit crab fossil was discovered in 2002, in the Yorkshire, England village of Steepton. Paleontologist Rene Fraaije spotted the crab in the shell, which, Scales writes, belongs to an ammonite, “an extinct cephalopod that swam through far more ancient seas, in the Lower Cretaceous around 130 million years ago. After it died it sank down to the seabed where a crab scuttled past, picked it up and climbed inside.” It’s the only one found in an ammonite so far. 6. NO TWO ARGONAUT SHELLS ARE THE SAME. For a long time, scientists believed that argonauts stole their thin, iridescent shells from other animals. Jeanne Power, who invented the aquarium in 1832 so she could study argonauts, discovered that the animals are born without shells and, when they reach about the size of a pinky nail, begin to make their shells. But unlike other mollusks, which secrete their shells with their mantles, female argonauts use glands in two of their arms to make, and repair, their shells. (Male argonauts don’t make shells.) Because of all that repair work, no two argonaut shells are the same. Argonauts—the only octopuses that still have a shell—can come completely out of their shells, which have ribs and ridges that reduce drag as they move through the water. They use their suckers to hang on, and they’ll never completely abandon their shells. If you take its shell away, an argonaut will die. 7. ONE OF THE OLDEST KNOWN SHELL COLLECTIONS WAS FOUND AT POMPEII. The collection was preserved in the eruption of Mount Vesuvius in 79 AD and consisted of “shells that came from distant seas, certainly as far as the Red Sea, that seem to have been kept for the simple reason that they looked pretty,” Scales writes. 8. THAT SHELL YOU BOUGHT ON VACATION? IT WASN’T COLLECTED ON A BEACH. “Plenty of shells are left behind by mollusks that died of disease, predation, old age, or some other fate, but those ones don’t stay pristine for long,” Scales writes. “Chances are that your gleaming shell was taken from a living animal; it was collected and killed and its shell removed and sold into the shell trade, so that ultimately you could buy it.” No one is sure how many shells are traded each year, though it’s thought that around 5000 species of mollusk are targeted. And that trade is very likely affecting wild populations; in some areas, species of mollusk have smaller shells than they did in the past, “a strong indication that not all is well and the larger specimens have been depleted.” When buying shells, be sure to avoid large species like the nautilus (which take a long time to reach maturity, don’t have many young, and are already over-hunted)—or don’t buy at all.